This is a unique design for an iPhone or iPod. This is perfect to carry and protect your high tech gadget but will also act as a stand for hands free viewing. 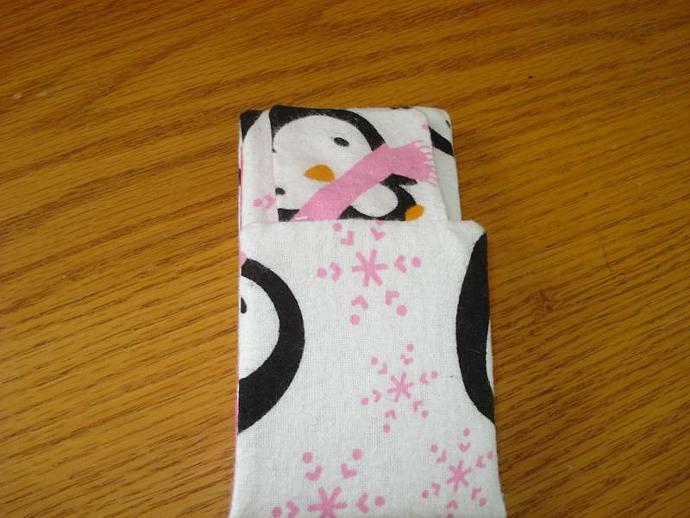 Made in a cute flannel with penguins and pink snowflakes on a white background. Sections of batting covered cardboard give stiffness and protection. Closed 5.25" x 2.75" x 1"
Fully opened (minus tab) 13" x 2.75"
Holder section 4.5" x 2.5"